With temperatures in the twenties and the snow ready to fly, it was the perfect weekend for comfort food. I've been making a lot of brisket and short-ribs over the past year and wanted to try something different. I fought off a few crazy women at the grocery store and brought home a nice beef chuck boneless eye round. 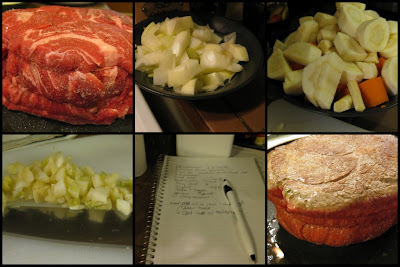 Out came the slow-cooker, the meat could roast while I got to work on some cheddar-scallion biscuits and latkes. In the spirit of holiday creativity, I made up my own pot roast recipe. I checked an old Cooking Light slow-cooked pot roast recipe for cooking tips and then opened the fridge to pull out the ingredients. For the roasting liquid, I had a bottle of unused Castle Rock Pinot Noir (no red drinkers at my Thanksgiving feast). We had enough for dinner, and two lunches each (6-8 servings, depending on how hungry you are). For the side dishes, I cooked up three options. 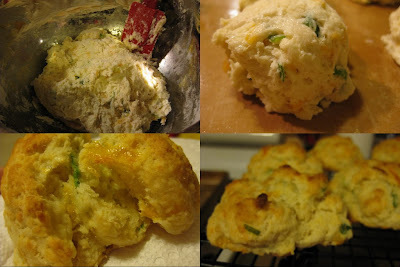 First, cheddar-scallion biscuits. Second, traditional potato and onion latkes. Third, sweet potato and scallion latkes. All delicious, and all great with the pot roast! I'll write up the latkes tomorrow. For this post I'll focus on the pot roast and biscuits. The biscuits on the side were fabulous! I'll let you check out TracyFood for the recipe, but will share my mouth-watering photos below. I love pot roast. This sounds like a great recipe! I'm obsessed with latkes this year... my mom even had me make them for my family for breakfast Christmas morning. My younger siblings put ketchup and cheese on them - they're so weird with food sometimes. Pot roast is the ultimate comfort for me! Your version sounds wonderful!